The Castle of the Teutonic Order in Malbork is an architecturally influential brick castle complex built by the Teutonic Knights. 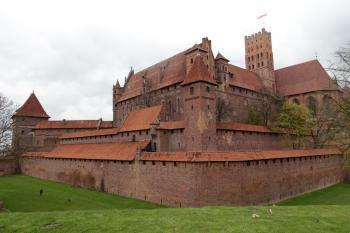 Malbork Castle was founded by the Teutonic Order after the conquest of Old Prussia. Its main purpose was to strengthen their own control of the area following the Order's 1274 suppression of the Great Prussian Uprising of the Baltic tribes. Malbork (or Marienburg in German) was built from the late 13th century by the Knights, who controlled at that time the Baltic coast. From 1309 Malbork was the Order's headquarters. 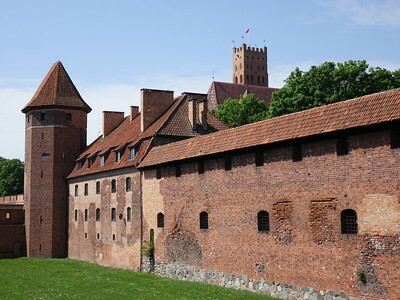 Following major damage during World War II, Malbork Castle was extensively rebuilt and restored. It has kept its original Medieval design. Malbork Castle was the headquarters of the Teutonic Order's crusader state. The castle had both a religious and a political function: here lived the Grand Master and the daily management of the Order, and about 3,000 knights. The castle was built at the end of the 13th century, and was expanded ever further. It is entirely made of brick, and according to unconfirmed sources this is the largest area of any castle and/or the largest brick building in the world. I went to see it on a half-day trip from Gdansk. My visit was on a sunny Saturday morning, and because I was expecting crowds I had purchased an entrance ticket online beforehand (I did so as well with all train tickets on this trip). I arrived at the Malbork train station at 8.45 a.m., and from there I had a 15 minute walk to be at the gates at the opening hour of 9 a.m.. Local authorities have not bothered to sign the way to the castle, but it lies on the right side from the station and then straight ahead until you see the red towers on the horizon. From the train you’ll already have a tantalizing view of it. At the entrance I picked up my pre-booked audio tour and headphones, and went ‘in’. If you want to save money or are in a hurry, you can also choose to view only the exterior: access to the complex within the walls is free, and there is plenty to see there. It consists of 3 separate parts: the High Castle, the Middle Castle and the Fore Castle. They are surrounded by canals and different rows of defensive walls. The audio tour will guide you through the entire complex. It’s a ‘smart’ device, it acknowledges where you stand and then tells you what’s to see and how to continue. There is a story in every room - at a given moment it seems like there is no end to it. After the guide led me to the courtyard for the third time after 1.5 hour and stated 'now we are halfway', I decided to quicken the pace from then on. I skipped some rooms and exhibitions (the amber museum has some fine pieces, but I can do without a large collection of weapons) to keep my visit at about 2.5 hours. One of the most beautiful spaces within the castle grounds is St. Mary's Church. It is entered via the Golden Gate - a door framed with colourful figures with a golden glow. This church has been badly damaged during the end of the Second World War, but in recent years they have continued to restore it towards the original state and in 2016 it has reopened. The castle derives its OUV partly from its restoration and conservation methods. Although it was substantially damaged during World War II, it could be restored by using “the abundant and meticulous records of those responsible for restoration and conservation works in the 19th and early 20th centuries” (including Karl Friedrich Schinkel). I am always happy to visit a site that featured prominently in one of my high school history books. Malbork Castle (or the Marienburg in German) is one of them. The seat of the Teutonic Order it was a key driver for Germans migrating eastwards. It’s also closely tied to Prussian history and as such as part of the Gerrman nation state origin myth. The first king of Prussia (technically King in Prussia) was a high master of the Teutonic Order. Blessed by Luther he converted to Lutheranism and became a worldly ruler. In the process he also took possession of all church possessions. Finding faith seems to have its advantages. The site itself is surprisingly large. I think you can easily spend multiple hours exploring all the ins and outs of the castle. But you will hardly be on your own. This is very popular with tourist groups and the amenities of a medieval castle (even a very large one) get strained quite quickly. Still, this certainly features with the best castles on the list. There are more or less hourly trains connecting Malbork to Gdansk and the rest of Poland. From the train station it’s a 15min walk to get to the castle. I came in from Gdansk where I had spend too much time at the ticket booth of the train station and missed a train. I continued to Elblag which is a nice contrast to Gdansk. From Elblag I ventured on to Augustow for the tentative site Augustow Canal (4-5:30h bus ride). I wanted to also visit the prospective site Elblag canal, but didn’t manage due to lack of time. This fortress was founded by the German Teutonic Order and steadily expanded what makes it today the largest brick building in the world. This fort is in very good condition and is well worth a visit. Due to the size of the complex, however, it should be at least 2 hours to schedule a visit. This castle must be listed for its massive size and for the millions of bricks used in its construction. I did not find the structure aesthetically pleasing. I did however admire the frescoe of the 'Last Supper' in the Chapel. While not as large as Leonardo's in Milan, it is in much better condition. Malbork is a wonderful piece of history..and has been wonderfully restored after the terrible distruction during WWll.. How sad to try to wipe out the pride of the Polish people. Our tour was very well done and we could have stayed hours more. So beautiful. There is something about big sprawling castles that unlocks the child in me. Malbork certainly did that, for as soon as I had traversed its draw bridge and penetrated its defensive walls I wanted to run and look down every corridor and creak open every heavy wooden door. The castle is massive and it dominates the town of Malbork. You can see it from miles away, and the view from the train as you cross the river from the north is a hugely impressive way to enter a town. The castle was badly bombed during the Second World War, but the restoration has been remarkable, returning the structures to their original grandeur whilst making it possible to see what has been rebuilt by looking at the patterns of the bricks. The striking interior of the chapel shows the restoration very well. Scattered around the castle are several displays of art works and I particularly liked the gothic sculptures and the images of its use during the Nazi occupation. Its role as the former base of the Teutonic nights proved a wonderful propaganda coup for the Third Reich. I don't think I visited the entire interior as it is a very large castle, however I did really enjoy just wandering off down dead ends providing unexpected glorious views of the ramparts. Malbork is a very impressive castle with an intriguing history and it makes a very worthwhile trip Gdansk though do try to get the express trains if possible as the regional ones were fiendishly and needlessly slow. As happens with the majority of the other sites classified by the UNESCO in Poland, this castle has been rebuilt and you can feel easily the atmosfere of the teutonic times. It is a massive construction, with huge walls and tall towers near a river. 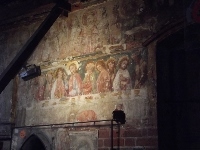 Some parts of its interior are being restored, especially a very nice church inside, and you can find there some shops and exhibitions of Polish contemporary art. A place well worth visiting. History come alive within this castle, and although wrecked by the communists trying to delete the history of Europe, there is a lot saved from the times of the teutonic knights. Damaged in World War II: The Castle was partly destroyed by artillery bombardment in 1945, at the end of World War Il. Vistula: It lies on Nogat, one of Vistula’s arms. Teutonic Knights: One of a series of fortifications known as "Ordensburgen". These were originally constructed by the TK and the Livonian Brothers of the Sword (who merged into the Teutonic Knights in 1237) to fortify territory in Prussia and Livonia against the pagan aboriginals. The Crusades: Criterion (iii): .... "The Castle is at the same time the major material manifestation of the Crusades in eastern Europe, the forced baptism of the Baltic peoples, and the colonization of their tribal territories"
Built or owned by Germans: Built by members of the Teutonic Order, a German Roman Catholic religious order.